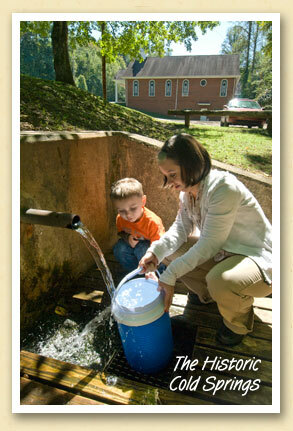 Christina Smith and son Aiden fill a container with pure mountain spring water from the historic Cold Springs — just as Bryson City area residents have been doing for many generations. It was because of the spring’s popularity that early residents established the Cold Springs Baptist Church there in 1851, when the area was still part of Macon County. When the new Swain County was carved out of Macon and Jackson counties in 1871, the Cold Springs meeting house served as the new county’s first courthouse and later doubled as a schoolhouse. The original 19th century wood frame church was later replaced by the brick structure above.